For many British travellers, especially younger generations, a visit to Germany simply means heading to Berlin. The clubs, bars and galleries of the rapidly developing capital are enough for fun-seeking holidaymakers looking to spend a weekend away. But, with nearly 40 million international overnight visitors last year, Germany is one of the most popular tourism destinations anywhere in the world, and has a great deal more to offer the adventurous traveller. 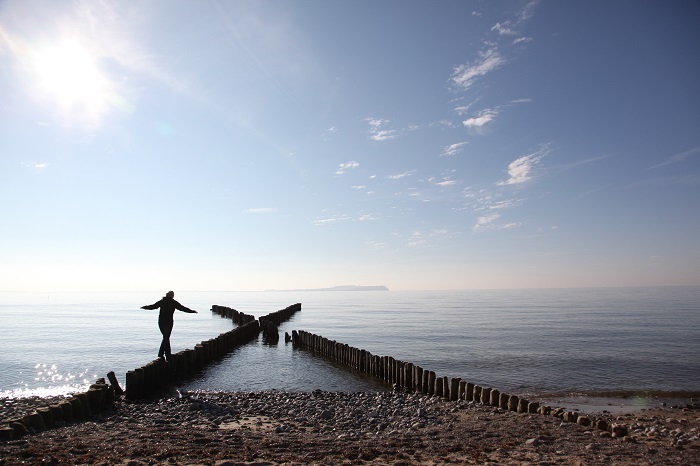 A shining example is Rügen, situated on the north-east coast and looking out toward Sweden and the Baltic states. At just over 900 square kilometres in size, it is the largest island in the country and home to one of its most important tourism regions. Yet, it is almost completely unknown to British travellers. I will admit to being slightly in the dark as I set off from Berlin, hastily researching what I could expect to find as I boarded the train in Berlin. After three hours on the always efficient Deutsche Bahn, I arrived in the seaside town of Binz, the hub of the local hospitality sector. The quaint resort is the crown jewel of Rügen’s tourism sector, which welcomes around two million guests each year. 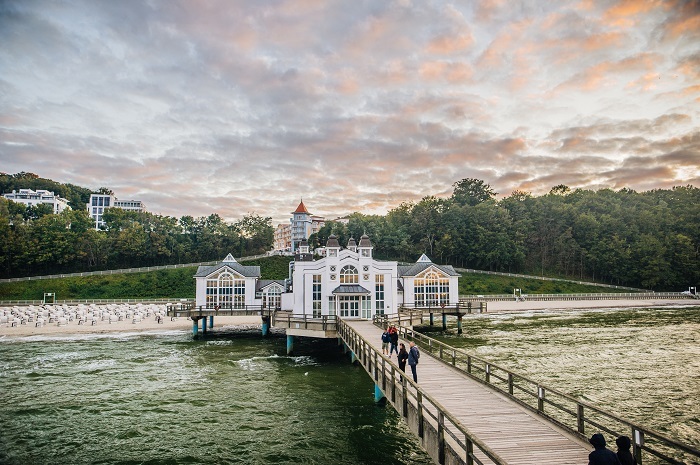 Accommodating a largely German market, with a few visitors from Sweden, Austria and the Netherlands, Binz is considered a wellness destination par excellence, with the bracing winds, crisp air and stunning scenery drawing the crowds. Although temperatures only reach the mid-20s Celsius in the summer months, and were considerably chillier during my stay, the infrastructure is on a par with anything one would expect to find in a higher-end Mediterranean resort. Here rows of immaculate white guesthouses, completed in the ‘spa architecture’ style, gaze out over the Baltic in a serene silence. Dreamy bay windows (originally painted white using chalk from nearby cliffs), playful wood carvings, and fanciful weather vanes give the town a timeless air, always welcoming. This is a town dedicated to a slower way of life, a place of relaxation, rest and recuperation – and it has been for many years. Tourism in Rügen was initially focused on the town of Putbus, a little inland to the west of Binz, where a wealthy court of aristocrats centred around Kaiser Wilhelm II would come to take in the air. But as bathing grew more popular, following the example of the spa town of Bath in the UK, attention shifted to Binz and its miles of spotless sandy beaches. Well-heeled visitors would journey overland to the coast, staying in accommodation rented from locals, including rapidly converted barns and stables. “Mother let the chickens out of the stable, the guests are coming,” ran the saying at the time, according to my guide of the town. As residents shifted their attention from agriculture to tourism, the result was a town almost completely dedicated to hospitality by the early 20th century. Prosperity was dampened after WWII, when Rügen languished in the German Democratic Republic. During this period, Russian forces expropriated a vast swathe of property and the town was flooded with over one million wartime refugees. But in recent years it has undergone a remarkable revival. Since the Berlin Wall came down, three decades ago this year, Binz has been a success story: investment has flowed into renovating the historic properties along the seafront, with each returning to its former glory. Now the town is home to a well-heeled, older and affluent clientele from across Germany. Binz, and Rügen more generally, is able to take advantage of its position between Hamburg and Berlin – if you want to visit the seaside in north Germany, this is your place. Today, there are 30 hotels – including the prestigious Kurhaus and Cerês properties - as well as thousands of self-catering apartments, including those at Dünenpark Binz. Of the perhaps 6,000 inhabitants of Binz, around 75 per cent make their living from tourism, illustrating its importance to the local economy. However, English is not widely spoken. This is perhaps a legacy of the time the island spent as part of the Russian-dominated GDR – but in the main tourist areas, a non-German speaker like me can get by with a few words and a lot of pointing. 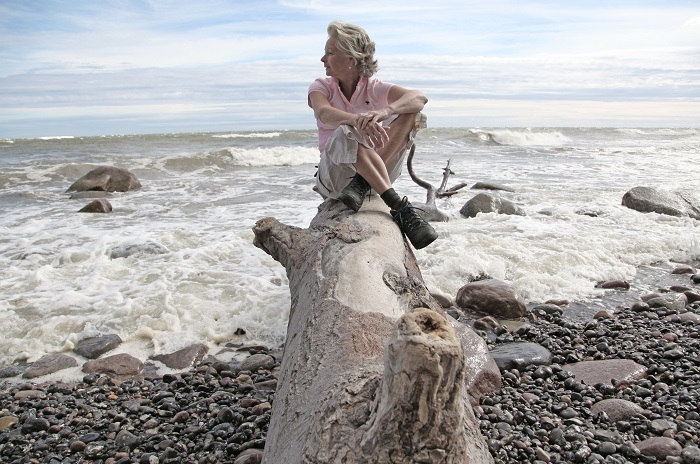 Locals can be also be a little taciturn, but this is not a sign of unfriendliness, just a reflection of a hard life on the rugged coast of the Baltic. Chat to any to anybody and they will make the time to help you out. Picturesque as it is, Binz is best seen as a base to explore Rügen more generally. The island is famous for its national parks, including the smallest one in Germany, Jasmund. Here walkers will find countless trails along the craggy coast to explore, with views over the sheer chalk cliffs truly something to behold. There is also an abundance of flora and fauna on display, with protected orchid varieties blooming in the meadows. Enchanted beech woods, mysterious alder groves and 4,000-year-old flint fields also make this a truly extraordinary place. At the centre of it all is the Königsstuhl National Park Centre, a hub for ecological study in the area. Although focused on the Königsstuhl (King’s Chair) chalk formations, the centre offers guests a broad overview of the area and its natural significance. The park is home to a unique piece of nature in the form of ancient beech forests that are almost untouched by human hand. These are of such outstanding importance that UNESCO declared them, together with other selected beech forests, to be a world heritage site. In the forests, the natural cycle of growth and decay continues undisturbed. They are even more precious thanks to their unique integration in the surrounding environment, associated with the broad view over the Baltic and of the chalk coast. 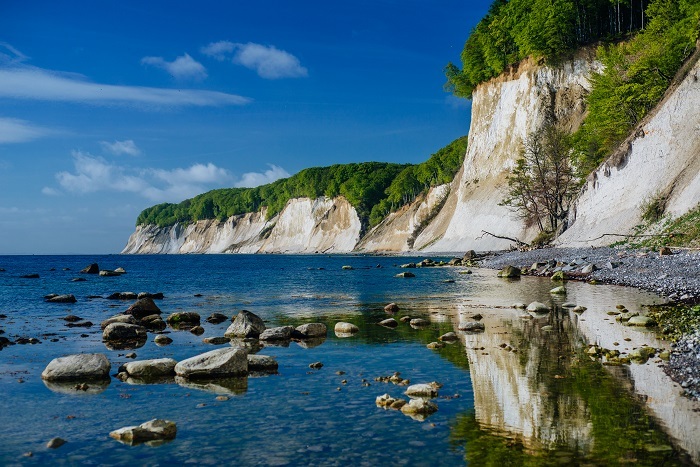 The centre has a mandate to showcase the natural environment of Rügen to visitors as well as highlighting its global significance. Back inland nature again takes centre stage at the Naturerbe Zentrum Rügen - a huge treetop pathway through the local forest. Here a 1,250-metre-long treetop walk takes guests through the forest canopy on a route packed with information and adventure stations. 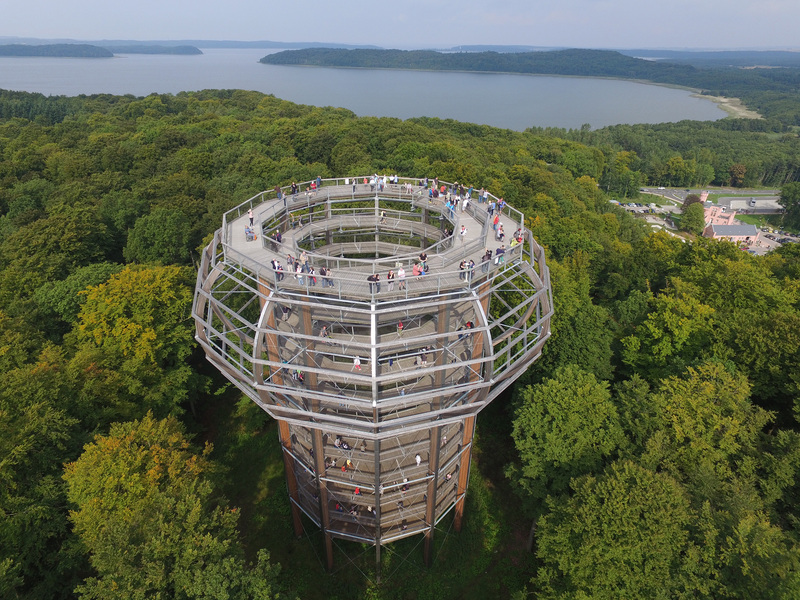 At the centre is the Eagle’s Nest, a viewing platform situated 40 metres above the ground offering fantastic views over the island of Rügen, the Kleiner Jasmunder Bodden (lagoon) and the Baltic Sea. “We want everyone to experience the uniqueness of this landscape together with its flora and fauna,” explains site manager Jürgen Michalski. The Naturerbe Zentrum is located in eastern Rügen, covers 1,900 hectares, and is home to three very different types of habitat: forest, open habitats and wetlands. Previously a restricted military area, the grounds are now home to numerous endangered plant and animal species – a must see for any visitor to the island. For those with more time, the Rasender Roland steam train trundles along the coast of the island offering a glimpse into the past, while the historic site of national socialist holiday camp at Prora offers a totally different perspective. Rügen has something for everybody, from young adventurers, to spa seeks and history buffs - not bad for somewhere nobody has ever heard of. 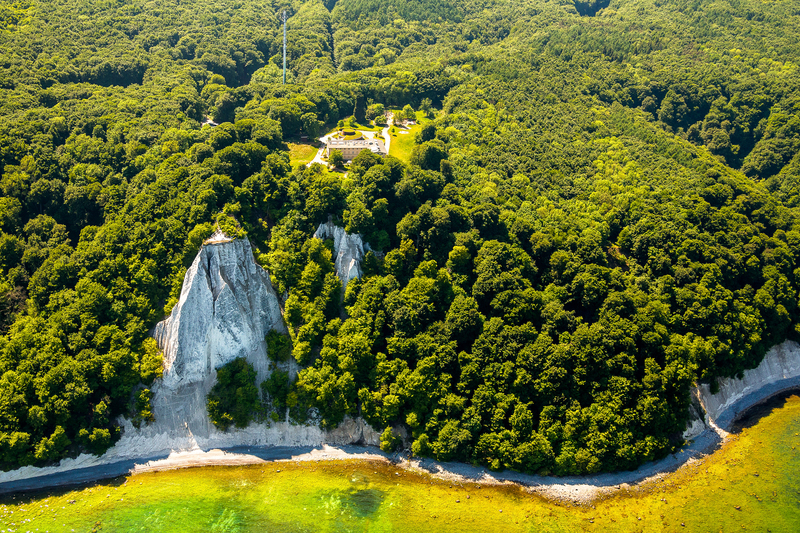 Rügen Tourism is charged with the promotion of the island as a travel destination. The organisation functions as a networker and promoter for the island and acts as an intermediary for tourism development. In co-operation with key players involved on a local, regional, state and federal level, Rügen Tourism works to support an ever-growing industry. For more on visiting on Germany more generally, head over to the official German National Tourist Office website.